尊敬的阁下们，自然规律使我为姐姐的去世感到悲伤，责任的重担压在我的肩上，使我感到惊愕。但是，鉴于我自己是上帝所创造，命定要服从他的派遣，我将服从他的意旨。我衷心希望我在履行赋予我的这个职责、担任上天意旨的执行人时，能得到上帝的帮助。And as I am but one body naturally considered, though by His permission a body politic to govern, so shall I desire you all ... to be assistant to me, that I with my ruling and you with your service may make a good account to Almighty God and leave some comfort to our posterity on earth. I mean to direct all my actions by good advice and counsel. ^ "I mean to direct all my actions by good advice and counsel." Elizabeth's first speech as queen, Hatfield House, 20 November 1558. Loades, 35. ^ 2.0 2.1 Starkey Elizabeth: Woman, 5. 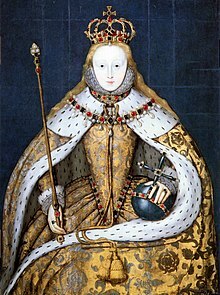 ^ An Act of July 1536 stated that Elizabeth was "illegitimate ... and utterly foreclosed, excluded and banned to claim, challenge, or demand any inheritance as lawful heir ... to [the King] by lineal descent". Somerset, 10. 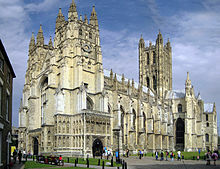 ^ Weir, Children of Henry VIII, 7. ^ "Venice: April 1603", Calendar of State Papers Relating to English Affairs in the Archives of Venice, Volume 9: 1592–1603 (1897), 562–570. Retrieved 22 March 2012. ^ Stoyle, Mark. West Britons, Cornish Identities and the Early Modern British State, University of Exeter Press, 2002, p220. ^ 21.0 21.1 Loades, 11. ^ 28.0 28.1 Neale, 33. ^ Elizabeth had assembled 2,000 horsemen, "a remarkable tribute to the size of her affinity". Loades 24–25. ^ Full document reproduced by Loades, 36–37. Eakins, Lara E. (2004) Elizabeth I.
Thomas, Heather (2004). 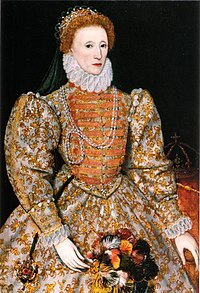 Elizabeth I.
Perry, Maria. (1990). The Word of a Prince: A Life of Elizabeth I from Contemporary Documents Woodbirdge: Boydell Press. Elizabeth I, Anne Somerset（1991）ISBN 0-385-72157-9. Stevens, Garry. (2004). "Bloody Mary: Further Intrigue in the Tudor Court".